I have had the opportunity to use the Lifesaver II by Mio over the last few months and have to tell you, I don't know what I have been doing living without it for so long. 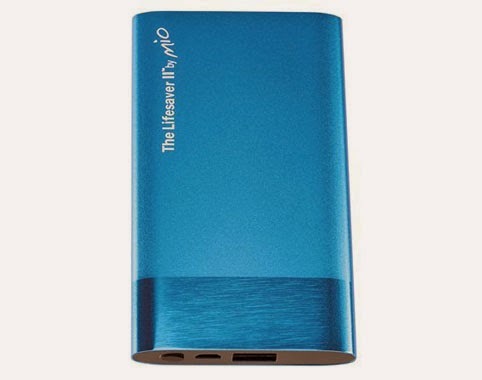 The Lifesaver II is a portable power pack for your cell phone or tablet. I've primarily been using it for my phone and it really has been an amazing little accessory. I got a new phone around the holidays and I haven't been dealing with as many battery issues as I had in the past, but that doesn't mean I don't overuse my phone sometimes and totally need a way of getting some juice. Ideally the best way for a blogger like me to test one of these portable chargers would be to attend a conference. And I was able to do that recently, twice. The first huge test was when I attended a social work conference earlier this month and was there for the entire day. I relied on my Lifesaver to keep me charged for any online reading I needed to do, but what I didn't expect was that I'd end up helping my neighbor at the conference, as well. The gentleman sitting next to me was having issues with his phone and I totally plugged him in and charged him up so he could turn his phone on and see what was happening. I think I just sold him a Lifesaver II! He even wrote it down. Admittedly, he was an older gentleman, and I don't think he even knew that portable phone chargers existed. I also had a full weekend worth of opportunity when I attended the Shot@Life Champions Summit in DC a few weeks ago. It was the first time I was away from home for several days straight and using my smartphone pretty excessively. As anyone can tell you, when you attend a conference as a blogger, you're likely to need your phone or your tablet to keep active on social media during the trainings and sessions. And this event was no different. I also found myself away from the hotel and out on the hill (yes, the hill in DC! More to come on this soon!) and I needed to know that my phone would be working no matter what. This charger did not disappoint. I'm thrilled to have it and thrilled at how quickly it charges my phone. I pretty much keep it in my bag all the time now with the small cable attached. The only disappointment I had was that there was no attachment to charge my iPad. Although I've read that it does work with them, so maybe mine was missing? Either way - no matter - it's still a great charger. I know today's society it's awful how reliant we are on our phones, but sometimes, when it comes to blogging, our jobs, our roles as parents or employees, we're counting on them - I know you feel me. And so the Lifesaver II by Mio has absolutely helped me to be more available and helped me avoid the anxiety of that dreaded flashing low battery warning! I'd definitely recommend this product for those in the market for a portable charger. It's really sleek and can fit into a pocket in my bag WITH my cell phone. It's not clumsy, clunky or any other type of negative adjective you can think of. So check it out! And if you do let me know what you think. I'm curious to hear your opinions.